Showing results for tags 'xp1000'. With riding weather here & the first big weekend in the dunes upon us, 4 The Truck has in stock a lot of popular items for your SxS. Call (702) 434-9274 or stop in today. From wheels & tires, sand or dirt, RZR Carrier bearings & Turbo front diff bearing kits, Cam Chain Tensioners, S&B Particulate filters, Uni Foam Filters, Wet Sounds soundbars & subwoofers, Bucket & Bench Seats, Polaris & Can-am OEM Belts, Gates Belts Rugged Radios, 4 point harnesses, Dragon Fire products, Clutch Kits, Rotopax fuel cans, HD Radius Rods, and much more ALL IN STOCK! If we sell it, we install it! We also offer tune up's, clutch services, Suspension upgrades from Walker Evans Racing, Fox Shocks & King Shocks. Fabrication available for all your custom wants. 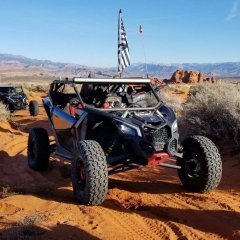 Rogue Racing has recently released our UTV line consisting of the following for Polaris RZR -Front Suspension Control Arms -Rear Suspension Trailing Arms -Rear Adjustable Radius Rods -Rear HD Radius Rod Cage Check Out More Here Our Cages Are Coming Soon! Pro Armor XP1k Stealth Doors now in stock. These fit over the stock doors, giving stock fit with Custom pro Armor look. These are on Holiday Special for $450.00 Limited to QTY on hand. Come by and check them out.